This ABM-300B die cutter is numerical digital equipment with computer controlled. The driving program named "Auto Bender Manager" is standard Windows style. This softer ware integrates with the strong drawing functions similar to AutoCAD, just need to finish carton folding and making process by clicking the mouse. This die making machine can finish broaching, deformation, bending mark, nicking, bridging, lipping, and cutting of continuously. ABM-300B die making machine is an efficient carton, board, box processing equipment. This ABM-300B automatic die maker can reach a higher level similar to die cutting machines made by Italian SERVI-FORM. This automatic die maker is multi-purpose for different specifications in paper board processing. Regarding the safety of the machine, the control system of the die maker uses “Auto Bender Manager” that can control the working speed automatically, even when operating sharp corners, arc corners, overlong figures, cuttings, etc., and in the procession of working, the users can change to "step by step" function to guarantee safety. In the meanwhile, by the adoption of the Auto Bender Manager, this automatic die cutter is very easy to operate, easy to change the bending tools, adjusted to the AutoCAD files, and there is simulation bending function to avoid operation errors when some one is not so familiar with it. 1. 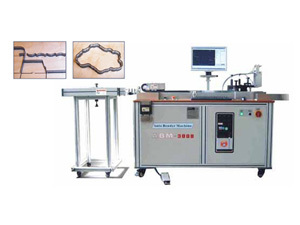 By Auto Bender Manager, the die cutter can optimize itself automatically even when dealing with tangency, connection, etc, and can, by pre-setting, ignore ill tangency or ill connection in the drawings. 2. Those files such as DWG, DXF, and NC can also be supported, and also it is supporting network file transfer. 3. By the Auto Bender Manager Controlling, the rule length can be well controlled for the machine and also making length compensation automatically. You will have what you want, do not need to test the rule again and again. 4. This automatic die cutting machine can suite multi-task, when operating, users can open several contour files at the same time and put several jobs together, so that idle time is reduced. 5. It is excellent for folding carton contours, carton figures and complicated graphics.